At the beginning of the month, we showed you Counterpoint Research’s numbers for the global Q3 market and today we have a further breakdown, including a cool infographic. 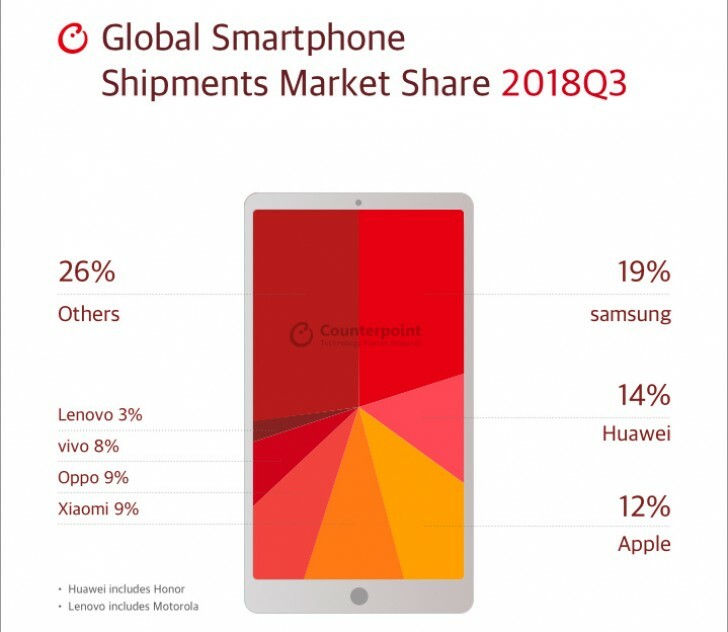 To rehash, in the months July through September Samsung captured the most market share (19%), fending off Huawei (14%), which in turn beat Apple (12%). Oppo and Xiaomi ended on par at 9% each, beating vivo’s share by a single percentage point. HMD didn’t ship that many phones, but its shipments grew 73% over the same three months in 2017. The third quarter of 2018 saw 5% less phones shipped, compared to Q3 of 2017 – totaling 380m units. Now the breakdown – Oppo took the Asian market with 16% total, followed closely by Huawei (15%), vivo (15%) and Xiaomi (14%). Samsung was relegated to just 10%. 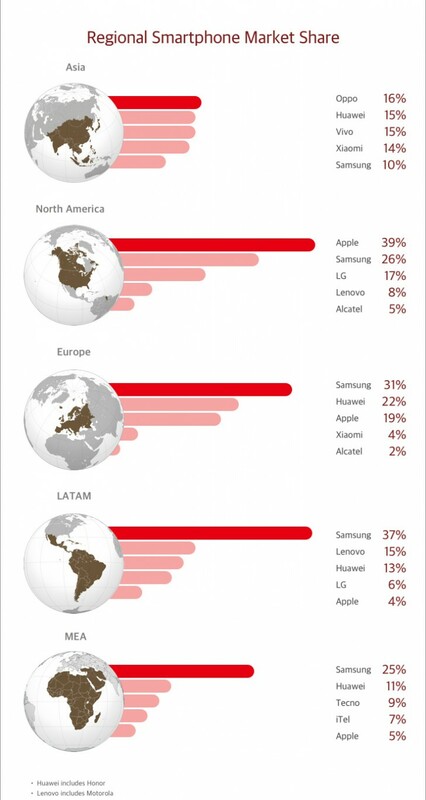 Unsurprisingly, Apple took the biggest portion of the North American market (39%), followed by Samsung (26%). Samsung’s strongest market was Europe with 31% market share, followed by Huawei’s 22% and Apple’s 19% – no other makers were close. Overall it was a profitable Q3 for some, despite the declining shipments. Samsung posted record profits, while Xiaomi offset a declining Chinese market with a strong showing in India. Apple’s shipments were flat but its skyrocketing average sales price helped Cupertino bring in the profits.